Yes, I've been up to something. I love it when a plan comes together. Some of you may know that I have a fascinating for science and technology. In the past that has involved several trips to Eindhoven in the South of the Netherlands, and what used to be called the NatLab. 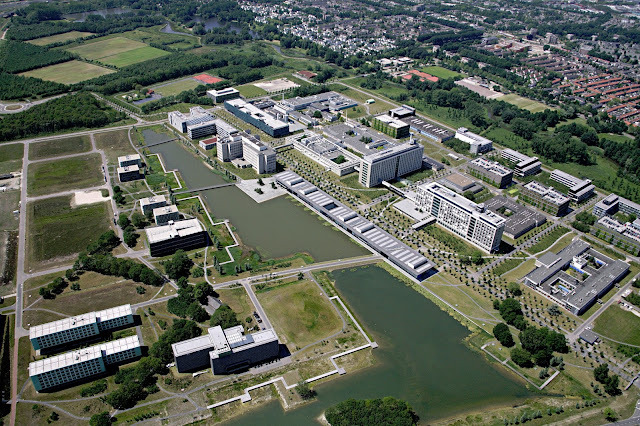 It was the R &amp; D science park set up by Philips in 1998. And it used to have a high fence all around the one square kilometre. Journalists had to bring a passport and the procedures at the front gate reminded me of Checkpoint Charlie between East and West Berlin. All this was needed because Philips made a lot of money licensing its patents. They're slogan at the time was "Philips Invents For You". Except that in 2003 they realised that closed innovation means you're not ready to compete in the digital age. It is now a time when the business model is not shouting but sharing. So the fence went away and Philips started a plan to sell off the real estate to make it clear that it was no longer the Philips Research Park. Today the old research park is now the High Tech Campus. It's home to 100 companies, 8000 people from over 60 countries. And they're expanding because the ecosystem that is blossoming there is running out of space. Two new buildings are under construction, one connected with healthcare, the other with LED lighting. Europe's answer to Silicon Valley. The large corporations on the site like ABB, ASML, Intel, Irdeto, NXP Semiconductors, NXP Software, Philips, Sentech, and SRB Energy, have realised the value of the positive, disruptive value of high-tech start-ups. These are young companies of around 3-6 people who have come up with a brilliant business idea and have a working prototype. The High Tech campus is rapidly building a reputation where innovative start-ups &amp; sme’s disrupt, innovate and get funded. Shapeways (3D printing), Sapiens Neuro (Neuroscience), Civolution (Media Content Fingerprinting), Genkey (Large Scale Biometrics), Intrinsic-ID (Sensitive Data Protection Across All Devices), are just some of the recent success stories. Infact I learned that a lot of the technology in my Samsung mobile uses chip technology developed on the High Tech Campus. I've been a mentor to a couple of accelerator programmes in Amsterdam. VC4Africa and Startupbootcamp Amsterdam. Now, I'm closely involved with building a very different kind of high-tech accelerator right in the heart of Europe’s equivalent of “Silicon Valley”. In fact, we’re convinced it has every chance of becoming the leading accelerator of its kind, because it is clearly focused on companies working in the most successful high-tech sectors. We’ve secured a prime location on “the Strip”, which forms the centre of activities on what’s known as the “High Tech Campus”. It can justly claim to be the R &amp; D capital of Western Europe with more than 1400 patents registered last year. It’s no wonder that the Eindhoven area leads in both brainpower and R &amp; D investments (US$4.5 billion dollars in 2012). Large international corporations like are just a few minutes’ walk from our offices. StartupBootCamp High Tech is driven by experienced entrepreneurs Guus Frericks &amp; Eric van den Eijnden of Dutch Expansion Capital. Patrick Gabriëls is leading the team on behalf of the Ernst &amp; Young partnership. And yesterday we launched the first mentor meeting to explain the plans and how mentors contribute to make the program possible - and much more effective than a couple of years at a business school. This bootcamp can draw on more than 500 world-class specialists and mentors in the 7 cities that form the Startupbootcamp international network. They have people covering a wide-range of relevant expertise. We’re also tapping into the mentor and investor networks of E &amp; Y and Dutch Expansion Capital. We believe that 70% of the teams in the program will come from outside the Netherlands. In these times of polarising discussions about immigration, remember that Silicon Valley USA owes its success to the input of foreign nationals. 56% of companies there were started by international founders. It’s the same story here on the West Coast of Europe. At the same time we see very aggressive campaigns by cities and national governments in order to attract the best to their part of the world. We’ve opened our application program to the world. But we’re starting an extensive active search to keep the standards at the top level. It's a safari in search of brilliance. And I must say - I love every minute of it. The areas where the Accelerator concentrates on. Machine to Machine communication. Networks of low-cost sensors and actuators used for data collection, monitoring, decision making and process optimisation. Includes intelligent lighting systems, personal entertainment, Micro Medical Systems &amp; relevant Nanotechnology.